You don’t have to live in a big city to have a big mold problem. With thousands of species out there, mold can grow in almost any conditions and survive on just about any organic debris. And thanks to billions of microscopic spores that float through the air and rest on every undisturbed surface, spores which can survive for years under harsh conditions, all mold needs is a little moisture to start growing. Whether you live in a small community like Adamstown or a major metropolis like Baltimore, you can’t get away from mold spores. However, you don’t have to live with major mold growths: for mold remediation in Adamstown, Frederick, Baltimore, D.C., or any other town in or around Maryland, you can contact AA Action Waterproofing. If you’ve ever seen food go bad and grow furry, you know what mold can do. The mold that grows on food can work quickly in the right conditions thanks to all the nutrients and moisture, but while the mold species that grow on wood and other building materials will usually move slower, it can still do some serious damage over time. You may not notice it for years if you don’t go into your crawlspace or basement very often, but a musty smell is a sure sign that mold is damaging the building. Then again, there are other ways of learning that you have a mold problem. The term “black mold” refers to a few different species of mold that produce toxins which can affect humans and other animals. 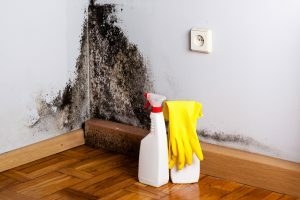 Symptoms include headaches, tiredness, a runny nose, and sneezing, so a black mold infestation can feel like a miserable cold that goes away when you leave your home. It likely won’t cause any permanent harm unless someone is very sick or very old, but no one should have to feel miserable at home. Mold remediation in Adamstown or anywhere else in Maryland always involves the same process. No matter how big or small the mold problem is, the first step is always to find sources of water or moisture and get rid of them. For instance, if the mold seems to get worse on a seasonal basis, you may have a ventilation problem. If mold tends to grow in summer, your home may be too airtight. Humid Maryland air gets in, but then it gets trapped, and if there isn’t a breeze or any sort of draft the mold spores can settle and start to germinate. If the mold gets worse during winter, your home may be too drafty. When the warm air from inside meets the cold air from outside, water vapor will condense, and the condensation will let mold grow. Other common causes of mold growth in basements and crawlspaces include flooding, clogged and broken drainpipes, leaky water pipes, a broken or ineffective sump pump, and a malfunctioning air conditioner. After all, the reason why A/C air is dry is so that moisture doesn’t build up in the ducts. Mold remediation in Adamstown can often be performed by building residents or workers without the need for professional help. After all, most of us do it all the time to keep our bathrooms clean. Like basements and crawlspaces, mold loves to grow in bathrooms, but by cleaning regularly we can keep mold from growing out of control. However, if you wind up ignoring a mold problem for years, if you need to renovate an old, disused property, or if your house has experienced flood damage, then it may be time to call in the professionals for your Adamstown mold remediation. Fortunately, at AA Action Waterproofing the first inspection and estimate is free, so you’ll know how much help you’ll need and how much it will cost before you have to commit to any expenses. For three decades, AA Action Waterproofing has been encapsulating Baltimore crawlspaces, waterproofing Frederick basements, and offering mold remediation in Adamstown homes. We can also repair and replace foundations, and we offer waterproofing consultation services for new construction. In all the years we’ve served the state of Maryland and beyond, we’ve never encountered a basement or crawlspace we couldn’t handle, so when you go with us, you can rest easy knowing you’ve put your basement or crawlspace in good hands.